The family would like to thank everyone for their kindness, messages of sympathy and attendance of today's celebration of Donald' life. *From: "Reminisces of World War II. Copyright,2008 by Donald C. Mellican. PREWAR: The Hap, Hap Happy Days! I, Donald, the aforesaid ‘myself’, the teller of this tale, was born in Rangoon on the 6th of October, 1923, in the very earliest of hours, of course. Rangoon/Yangon, the capital city of Burma/Myanmar (pronounced: ‘m’yumma’) means “end of strife” but was never so, with riots, earthquakes, wars before and after WWII. In fact there was violence on the night I was born: Hospital staff held me aloft by my ankles and smacked my bottom, making me cry. Sue them Don! Not a chance: they were all masked! But my Mother must have loved me because I was allowed to be born in the same room she occupied. In Moulmein we lived at in the centre of town at No. 3, Maingay Street, where we moved to from ‘Ravenscliff’ a large house grandfather had bought and was available to any Mellican who needed shelter. Diagonally opposite at No. 6 lived the Milners, Rowland (a playmate) and Dorothy who I eventually married.. but I’m going a little ahead of myself. More later! We boys went to St. Patrick’s English High School and the girls to St. Joseph’s Convent next door which was separated by a high brick wall—thankfully not high enough so we were able to watch many a gym-slip hockey match with accompanying squeals and screams, but also on alert that Sister Theophane did not photograph you, a sure invitation to Brother Director Marks study for six strokes, and you did not always have the opportunity to slip an exercise book down your shorts to absorb the stinging cane. The school authorities and our parents worked in close harmony, and all school misdemeanours were reported home and vice versa; hence, certain punishment twice for one crime! We all enjoyed a happy religious life with Dad, a Roman Catholic, and Mum a Church of Englander. The town itself offered a relaxed existence with two cinemas, much sports, adults organizing picnics and dances. Moulmein was a peaceful elongated town built in a north-south direction with a rising ridge (Rudyard Kipling’s pagoda included) on the east side sloping down to the Strand, and the Salween River on the west. The approximate population of 20,000 mixed nationalities and diverse religions lived in harmony, respecting each others culture. The town was mayoral and policed by a civil police force and the Tenasserim Auxiliary Force (later Burma Auxiliary Force (B.A.F. ), prior to annexation to India known as the Auxiliary Force India). From school boys loyal and true..” etc.etc. Dressed in my khaki shorts and shirt I sang lustily, however just eight years later in Army uniform, the words I uttered to him and his entourage were unprintable as they charged through to freedom at Htaukkyan (milestone 21) encouraging words to fight on to the last man. Bah! A revealing note of the peaceful Burma Donald Mellican’s family inherited. 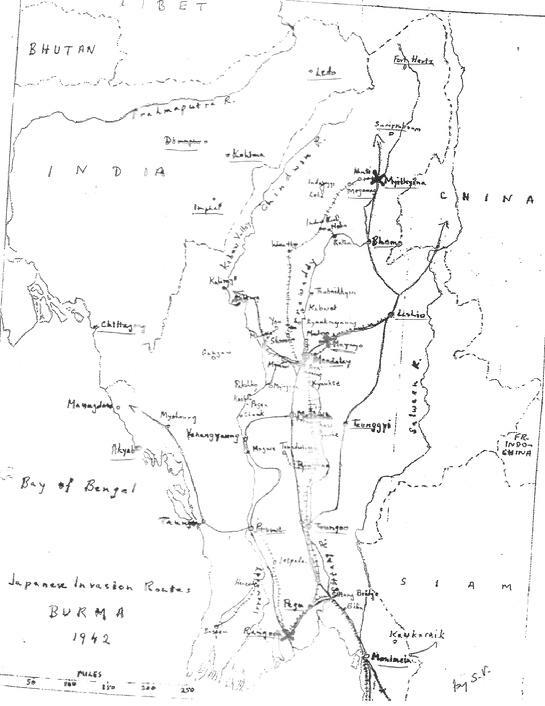 The Defence of Burma, and the Rout and Retreat of British forces to India. BAF Army training consisted of 2 hours weekly on parades and drills and a 2 week camp each year, weaponry (mainly small arms), and manoeuvres. In August, 1941 a Captain Gracey (or Gracie), with his wife, visited schools for volunteers for a newly formed A.A. regiment (Royal Artillery) on full time service. On the 1st of September, 1941 having taken Mums advice “Don, you come home if anyone is rude and nasty—God bless!”, about 40-50 of us “no more Shakespeare in Burmese types” boarded the night train to Rangoon in excellent spirits. Arriving in Rangoon September 2nd AM we were split up: some for heavy AA training in Rangoon, and the rest for Syriam on the 40mm Bofors i.e. 3rd Light A.A. around an oil refinery on this off shore installation. We programmed 1 week on day duty, and the next week on night. Every alternate week-end it was off to mainland Rangoon on the ferry. Our instructor was S/Sgt. Frederick Arthur Coates of the 2 Battalion Gloucesters Regiment. He knew his job but he was a slave driver, and we soon discovered muscles we did not know existed. We knuckled down sullenly, wished him all that was bad but little realizing that his toughening up regime would serve us well on our 900 mile retreat North-West over hill and dale to India: a rout more than a retreat due to Whitehall underestimating the enemy, mismanagement and total ignorance of their priorities, and the conditions and needs of our forces. We were superior in numbers but the Jap was experienced in warfare, since 1937, fighting China, was well-trained, tenacious, and madly not afraid to die. Our training in Syriam complete we took position on the Rangoon docks in November, 1941 for a few weeks, and then to Mingaladon Airfield along the runway which launched Tiger Moths, Blenheims and Brewster Buffalos. We were billeted outside the airfield and motored in on each duty shift. We dug trenches not only for ourselves but for the gun: a huge below ground level square trench; and should our position become compromised by spotter planes, then the whole digging process had to be completed on a new site, replacing the old site with bamboo gun replicas. Each gun crew consisted of an officer, a sergeant, 2 layers, 2 ammo suppliers and a loader. We all got on as a pleasant group. While in training we treated birds or friendly RAF planes as “enemy”, and on a shout of “Plane!” from a lookout on the gun we jumped to it. But at no time—no time—was the gun ever fired in training, and therefore, we had no way of knowing whether it would fire when needed!! If needed!! Was needed!! Every unbloodied soldier has his first day of “baptism under fire” firmly etched in his mind—it could be long on or it could be one of some minor details missing, and so mine arrived on 23rd. December,1941 about 7.00 AM on a bright and peaceful looking day. I had written and posted a letter home consisting of Christmas wishes and some money. We had started the ritual of 90 minutes each “look-out” duty on the gun when about 11:30 the “look out” shouted “Plane!” We hurriedly took battle stations expecting this to be a laying of sights on a passing bird or RAF plane, but this time there was a sound of distant planes—and peering into the sun we observed movements of silvery objects. Feeling this was different, I still did not realize that this was serious and real. The objects seemed to by-pass us on their way to Rangoon city but suddenly Leut. Hoe shouted “take cover out of range!” and a very frightened gun crew jumped into trenches. Our Bofors were meant for dive bombers and fighters, and in an emergency as field guns if the targets were not too low. Preceded by whistling sound the bombs began to burst all around us. I knew then that I could be dead. How dead? Seriously dead. I faintly heard my Mums “Come home if…”. The whistling, bangs, thuds and explosions appeared to last for hours but it was only minutes. “Action!” shouted Lt. Hoe as the Jap bombers and fighters came in low. I was on the Gun but cannot remember how I got there. Then things got hectic with orders: “Traverse right!’ or “Traverse left!” “4.30 left-half!” etc. etc. but each sighting concluded with “Fire!” The gun fired each time with a lovely “crack” and was most reassuring. In the heat of battle our confidence returned. By 12:30 PM the raiders had departed, leaving fires, delayed explosions and smoke. We hastily dug our gun in a new position, placing a dummy in the old pit. Rumours began to drift in: RAF planes lost, buildings hit etc., and I AA Bofors lost in a direct hit. Yuk. We finished our stint and were relieved by a night crew at approximately 19.00 hours (i.e. 7 PM), returning to our digs outside the airfield’s perimeter. In the digs we sit and whisper to one another with still no news of the lost gun’s crew. At about 20.00 to 20.30 hours (an hour and a half later) we have been “voluntered” to return to the dreaded airfield to pick up our dead (6 in all) with one survivor who I still can’t recall 60 plus years later. We return to the gun pit in a 3 tonner and feel completely revulsed and shattered—we were only 17-something years old then. The bodies are mangled, heads, limbs sprawled all over, and even the gun was splashed with flesh and brains sticking on metal. Only “ S. J.” (name withheld) seemed to have a complete body but was sprawled over the loading tray, his body cut in two by a bomb and machine gun bullets. “No one leaves until the pit is tidied and the bodies are on stretcher” was the order. We make –shift stretchers from bits of wood e.g. damaged furniture and doors. “Have you got an arm or a leg?” calls were made and eventually we had six figures ready. I recognized only two of them “F.B” and “J.K.” (names withheld), the former from St. Mathew’s and the latter from my school. We load up the truck and stop at the RAF Cantonment Church. The church entrance is reached by a narrow winding path, so I said to my mate Ludovic ( lead of the stretcher bearers) to step over the hedge as that would make it shorter. He clears the hedge but only half-way because something holds the stretcher from clearing the hedge. I put my hands under the stretcher and discover guts had spilled out and tangled with the hedge. I return the spillage under the blanket, and we continue to the altar rails, and add our stretcher alongside others. Camp is very quiet that night, some smoking and light whispering. Next morning some beds are empty—not having been slept in… I had no choice but to remain there as my home was an overnight train journey away. We continue the air battle much more reassured, and less fearful, but have vengeance added to our other feelings. An AVG (American Volunteer Group “Flying Tigers”) force had bolstered the RAF. On about the second week of March, 1942 we are told to take up posts in Magwe, after breaking through the Htaukkyan road block we join the pitiful flow of civilian evacuees fleeing north with their worldly possessions carried on heads, carts, and other odd wheel contraptions..
We now take up positions in Magwe, Mandalay, Maymyo, Mandalay again, and eventually in Shwegin. It was the second morning in Shwegin at approximately 4:30 AM, when the Japs poured lead into our positions from surrounding hills into this hollow where the whole retreating army was camped prior to the overland trek to India via Palel, Tammu and Dimapur. Instructions arrive that about dusk we would fire our guns, thus expending all ammunition into selected targets, destroy all guns and trucks, carry food and water, pack up small arms and commence the trek to India. At about the second day into the trek I was tempted to about-face to return to Burma as I was concerned about my family, but thought better of it and continued westwards. It was a hard-slog over a narrow path, conserving food and water up hill and down with extremely sharp bends to negotiate. The going got tougher each week, sometimes reduced to almost 8 miles a day. At one upward climb I passed an Indian woman with two children poised at a hairpin bend with a long drop. Before I took the next bend I turned to look back, and only two children were to be seen. I was carrying two tins of condensed milk in my pack (one spoon a day) and discovered that some milk had spilled onto my socks. I sucked the socks. Water was also a worrying problem as running water was not always available. After about three weeks of strenuous walking we eventually arrived at Dimapur and put onto the railway en route to India. I survived the trek repeating nursery rhymes, times tables, etc. On the second day out at a station, Red Cross ladies handed each a bottle of beer and a bag containing fruit and sweets. I said “thank you!” but the lady said “No, we thank you!” I could not understand why she would say this after a defeat!! I was admitted with malaria in the Ranchi hospital, thence to Mhow where we began training with borrowed guns. HUKAWNG “DEATH” VALLEY TREK, Northern Burma, May, 1942. Entire Mellican family, except little brother, meets with disaster. My family had left home in Moulmein on the promise by the British that they would be evacuated to India by air, but arrived at various airfields on their way north after Japanese bombings. This was so at Myitkyina as well, and so they set off on foot through what was to become the notorious Hukawng Death Valley route and suffered extreme hardship, starvation, disease and horrible deaths. According to a witness my father and Reggie (seven and a half years old and the baby of the family) were the last. 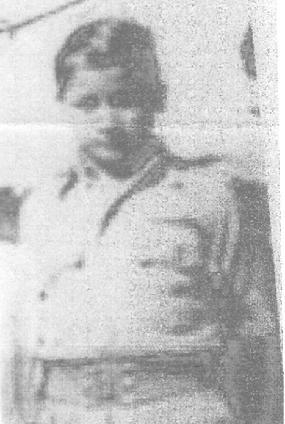 Dad, thinking he would not survive the trek, handed over Reg to a passing Gurkha family who hoisted the lad on their shoulders and continued toward Assam in India. On later inquiry by me, the Indian Red Crescent stated that my Dad did reach India but died there. Reg, a young lovable child, must have attached himself to his new adoptive family’s closeness and warmth, as Gurkha families are reputed to be, accepted his new way of life and eventually embraced his new culture. Whether he remembered his old culture is debatable. He has now a new name *'Dum' Bahadur Chettri, (sometimes pronounced Kettri) maybe a new religion too. He remained with his new family until hostilities with Japan ended, returning to Burma in Kalaw in the north sometime in 1946-47 aged now about 13-14 years. I was in Burma making enquiries at that time but had no luck in Moulmein and Rangoon. I now recalled an old letter that was eventually delivered to me in the Burmese jungles (where I returned as a Burma Intelligence corpsman. attached to the British forces) by an evacuee who had seen my appeal at the Loretto Convent, Calcutta list of missing people placed there during one of my leaves. Having completed my first war leave in Calcutta late 1942 I left a message on the Loretto Convent notice board for any incoming evacuees with any news of my family to contact me on c/o ABPO address (we were not allowed to give town address) as we ourselves did not know where we would be at any given year. Subsequently, maybe 1943 after Tiddim and Imphal, a grubby letter was handed to me somewhere in the jungles giving me sad news of my family. As soldiers we carried packs on our backs and I must have stuck my letter into that cumbersome pack and when we have a fire-fight we drop that pack and get engaged with the enemy hoping to retrieve that pack a.s.a.p but not always successful. But I knew the writer as a young lady (Juliet "Bumble" Williams from Moulmein). After the war and several years later in the UK-1974- I traced this lady (now married to a body builder, Cecil Elmore, formerly of Moulmein) who now resided in a nearby town of Maidstone, in Gillingtham, but when she heard that I wanted news of the trek she broke down and did not want to speak, so when Cecil came on the phone apologetic and requested the conversation should go no further I reluctantly agreed and hung up very disappointed. A couple of years later I heard that the Elmores had emigrated to Australia and died there within a few months of one another. Did they have friends or relatives to whom they may have confided those terrible events… Possibly. <?xml:namespace prefix = o ns = "urn:schemas-microsoft-com:office:office" /> As I had earlier touched upon the subject of the family�s pre-war stay in Moulmein: we lived on Colvin Road in �Ravinscliff�, a large house grandfather had bought and was available to any Mellican who needed shelter. In the next year or two we moved into the centre of the town to No. 3 Maingay Street. Diagonally opposite at No.6 lived the Milners, Rowland, a playmate, and Dorothy his sister. 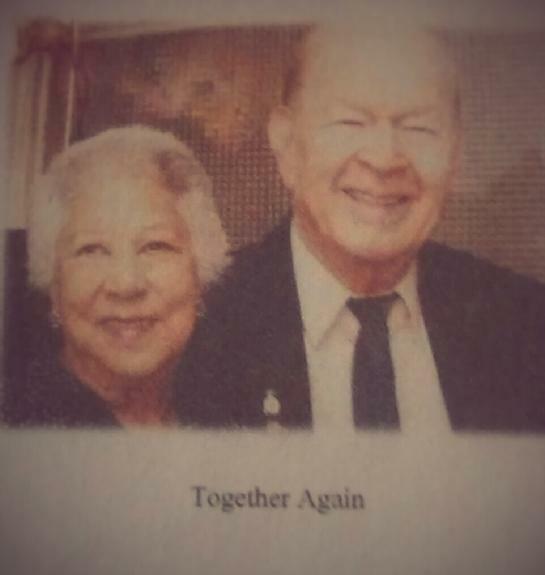 Because of her father�s transfers and the evacuation, we became separated over the years but I eventually married Dorothy in Simla, India where we met accidentally as adults! I decided, as many an evacuee had done so, soon after the end of hostilities, to return to Burma, but left Burma with my pregnant wife on the 4th. of January, 1948 (Burma�s Independence Day) on the last troopship S.S. �Scythia� escorted by the H.M.S. �Belfast� which was boarded by the Governor and his staff. It was a sad decision to leave your �home� but anti-western vibes could not be ignored even though I had passed selection for officer in the new Burma Army, I made application successfully to board the last troopship, with my wife, on the S.S. Scythia which had just left Singapore after picking up the last remaining British troops there. After an uneventful journey� we encountered just one storm�we landed in Liverpool on the 27th. of January, 1948 and traveled by train to Manchester complete with wife and captured Japanese sword. It was a tough new life with much bomb damage and rationing still in force. Jobs were plentiful but they were not looking for anyone whose experience was down to just killing in warfare, so it was back to cramming until I got my R.S.A. certificate and never looked back. Our living accommodations changed from rooming houses, to flats and then into owning our own house. The years rolled by as I smoothly fitted into a role of father of 4 children, 2 grandchildren and 2 great grand children. Also have been employed in the civil service and local government first in Manchester, Lancs., then a transfer to Maidstone, Kent where I am now retired comfortably with my family in close surroundings. We are a close-knit loving Christian family which should satisfy anyone, but I have never been able to shake off this void of another missing love for a family whose closeness I was permitted to enjoy for a few short years, and struggling with the knowledge that my youngest brother is still lost to me as I have never been able to locate him after his terrible ordeal. While employed in Manchester and in Maidstone, most off-duty days were devoted to the family and home, but even so any spare hours took up writing to embassies in India, Nepal, and Pakistan for news about my missing family, and centred on Reggies whereabouts. None were obtained from the authorities in Burma (Myanmar), the silence from that country remains, and is inexplicable. I have also tried many organizations: the Red Cross, Salvation Army and T.V. family tracing shows. No luck. However, an organization called �tracer� did put out a book, as did the Red Cross in their publication �ReUnited� attended by Princess Alexander and my wife Dorothy. Following the �Re-United� publication Sky T.V. turned up in my home in Maidstone with cameras and flood-lights which set off twitching curtains as neighbours thought I had won the Lottery! �Sky� screened a very well done story on �Remembrance Day 1995� while I was recovering from my right knee replacement operation in hospital, and the next 5 weeks walked about like a double-humped, three-legged camel with a hiccup. The noises I made due to my extreme pain resembled those of a camel in child-birth too. You must agree that it was not a good day for camels! In 2006-2007 an army acquaintance telephoned me to say that a Sandra Carney was trying to trace, on the Internet, a young Gurkha soldier who her family had befriended (adopted in a sense) in the 4th. Gurkha Regiment of which her late father (Raymond Campagnac, an ex Burma Intelligence corpsman colleague of mine) was Commanding Officer. This soldier came to their attention because he was taller, lighter complexion with light eyes, and spoke a little English. He was taken into the family and became close to little Sandra who was then 9 years old, until her father retired and left for the U.K. Sandra married a John Carney and now lives in the U.S., while Raymond�s widow continues to live in London. It is rumoured that the lad was baptized in the Kalaw R.C. church, adding �Dudley� to his name. Dudley Dum Bahadur Chettri married a jeweller�s daughter and with six children intended to emigrate to Australia/New Zealand upon retirement. Assuming he was eighteen when he joined the regiment, add 20 years service, he must have been about 40 when he emigrated and is now about 73 years old. Needless to say that the photograph Sandra sent me is a startling image of me at that age, and now all the search engines are operating at full speed especially when an ABC/Perth, Australia appeal in 2007 printed his photograph and disclosed that a Virginia Anthony (now deceased) knew him in Perth.!!. That was the first inkling we had that he did go to Australia.